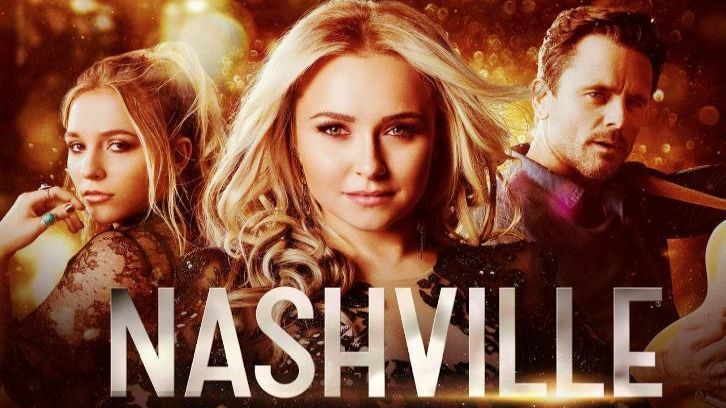 Nashville - For the Sake of the Song - Advance Preview: "A Simple Progression"
“For the Sake of the Song” is the third to last episode of the series, and some of the pieces of where the characters will end up are beginning to fall into place. Following this episode, it becomes pretty clear where certain storylines are headed, but I’m still confused about the outcome of others. Along with episode synopses, I can pretty much predict where the members of the Clayborne-Conrad clan end up along with Jessie and Brad. However, I’m not sure what will happen with Juliette, Avery, Gunnar, Will and Scarlett. I mean, there’s really been no focus on the music for The Last Highways, Scarlett or Juliette. It’s just been pointless love triangle stuff for the most part. And with only two episodes left, I’m not sure if the writers have enough time to rekindle or start certain romances with enough believability, not that has mattered much in the past. The only way I could see some of those things working is if the series ended with the flash forward montage that shows where the characters will end up à la “Charmed” and “Parenthood.” And speaking of the music, I sort of hate how off-track the series got with that. I’m not sure when but the series has devolved in a show that just so happens to feature country music artists, not the driving force behind. So now that I’ve said my peace, let’s get started. Deacon and the girls grow concerned when Gideon starts leaving the house. So of course, my first thought was that Gideon was out somewhere getting hammered and then returning to the Clayborne-Conrad residence when he sobered up. I mean, it seems like a foregone conclusion that a recovering alcoholic that disappears for hours on end would be hold up in some bar. Fortunately, the show decided not to go the super obvious route this time around and have where Gideon has been going tie in with this week’s walk down memory lane. Deacon and Gideon once again a have a differing of opinions over something that happened during Deacon’s childhood, with each of them remembering the events very differently. While viewers will once again see flashbacks to Deacon’s childhood from his perspective, we also get the added bonus of seeing how Gideon remembers some of it. Part of what has been so difficult about deciding whether or not to trust Gideon has to do with the one-sidedness of the storyline so far. Viewers have spent six seasons getting to know Deacon and hearing about his horrific childhood, so when we were introduced to his father it’s natural we would be skeptical. However, since the present-day Gideon didn’t match Deacon’s description of his father, viewers, or at least me, have been left to wonder what the truth really is. So by getting to see things, at least a little, from Gideon’s perspective, it helps to shed some light on a very gray area. Like I’ve mentioned in the past, we’ll probably never know the exact truth about Deacon’s childhood, but hopefully flashbacks like these clarify that neither of them are completely wrong or right; the truth is probably somewhere in the middle. Meanwhile, Twig struggles to keep Maddie from discovering Jonah’s secret, which essentially means the boring saga of Maddie’s love life continues. Based on the promos, we know Maddie eventually finds out Jonah’s been cheating on her with Mia and gets mad at Twig because he didn’t tell her. Whether or not this happens this episode, I can’t say, but it seems pretty obvious where this storyline is headed. As the show has established Twig is a good guy who has feelings for Maddie while Jonah is a lying cheater who forces his best friend to cover for him and prioritizes everyone else over his girlfriend. As for Maddie, despite all her flaws, I’d still like to believe she knows she deserves better than the likes of Jonah. I’d assume the series is going to end with Maddie forgiving Twig and them getting together, but I’ve been wrong before. While it’s about time Maddie found an appropriate boyfriend, in both age and a non-familial individual, as well as someone who treats her right, I wish so much screen time wasn’t devoted to these storylines. I feel like the show keeps reiterating just how awful Jonah is and how great Twig is. It’s like we get the picture you’re trying to paint. Can’t we just move on to the eventual fallout and what happens next? Did we really need to spend three-ish episodes watching Jonah cheat on Maddie and he and Twig hiding the fact? Couldn’t this have been done in one, maybe two, episodes top. During the first half of season 6, the show already showed how Jonah prioritized his friends and career over Maddie. We already know he’s a bad boyfriend. We get it. It’s time to move on. - So Juliette is back in fighting form as she confronts Darius, but her plan to take down the Movement for Coherent Philosophy doesn’t go as intended. As much as viewers, me included, love this “take no prisoners” Juliette, I really wish this version of her could learn to think through the consequences before acting. I mean, Hayden Panettiere is at her best when she’s playing “take no prisoners” Juliette, but would it really kill the country music singer to look before she leaps? - Alannah learns Brad’s inappropriate behavior isn’t limited to just her and makes a very [redacted] decision. Viewers have seen Alannah unapologetic for wanting to be with Avery, even if it hurt Gunnar, and then courteous when she was willing to walk away from Avery when Juliette returned. Like both of those decisions, Alannah’s offer to Brad is equally unexpected. I’d like to think I know the motivation behind Alannah’s actions this episode, but like I’ve said, we don’t really know her. I almost wish her character was introduced in season 5 because I’d rather have spent time getting to know her over two seasons than watching some others such as Hallie, Alyssa, and Zach. - Scarlett and Maddie really need to join a support group to stop meddling. Like it’s almost laughable how involved they are in other people’s lives who didn’t ask for their help. - In the last minute of this episode, a character discovers an item hidden under a bed that has the power to alter the course of several characters’ lives. So hit the comments below to let me know your thoughts. Where has Gideon been disappearing to? Will Maddie end up with Twig? Who discovers said item and what is it?